Generally speaking, what Ohio is doing by seizing animals and then leasing them to facilities, out of the state of Ohio, is illegal; especially if those animal are on the endangered species list. That goes the same for any facility accepting those animals especially when those animals continue to be owned by their legal rightful longstanding owners so really, it’s not up to the ODA (Ohio Department of Agriculture) or anyone else to decide where those animals will go other than the actual owners unless ownership was surrendered or thru court judgment, which in this case, was NOT!!! And FYI-no SUDI permits were issued to the ODA or Black Pine Animal Sanctuary. Frankly, I am not sure if any court in any capacity other than a court of law, has the right to take ownership -taking property is a constitutional protection to prevent witch hunts and to keep the government from taking or staking a claim to personal property. Laws of the state refer to public property and not property privately owned unless otherwise stated in the law. Black Pine Animal Sanctuary that has accepted several animals, this past year, that still belongs to their legal and longstanding private owners after being wrongly seized-The animals taken to out of state facilities from the ODA are under contract with the state of Ohio but neither I, nor anyone else has been able to locate a USDA permit for the ODA. Accordingly, when there are business transactions, such as the occurrences relating to the ODA facility in Reynoldsburg, Ohio, where the ODA is involved in the care of animals and then, creating contracts with facilities across state lines where they transfer the animals, as a lease or transfer of ownership, without a court judgement, a USDA permit is required by federal law concerning Animal Welfare. I inquired with a FOIA request weeks ago, for all records pertaining to the ODA facility for permits, pictures and inspection reports and have yet to hear back from the USDA. Every exotic animal owner in Ohio that has been subjected to the newly created illegal laws and illegal transactions concerning exotic animal ownership needs to know, that the ODA, has been operating illegally with no compliance with federal laws concerning animal enterprises. Any facility accepting animals from the ODA for ownership or lease is also operating illegally by accepting those animals when actual ownership remains with the longstanding rightful owner. Those animals would be considered stolen property. Furthermore, any facility that has accepted animals and the animal dies as a result, is subject to suits being filed against that facility. MASSILLON, Ohio (AP) — A 22-year-old baboon seized from a northeast Ohio farm in the state’s crackdown on exotic animal ownership died at a sanctuary while in state custody, and the owner is seeking answers about what happened. Cyndi Huntsman of Stump Hill Farm told The Independent in Massillon the state informed her attorney late last week that a female hamadryas baboon that had been sent to Black Pine Animal Sanctuary in Albion, Indiana, had died. The state didn’t explain how, she said. The Ohio Department of Agriculture, which oversees the state’s exotic animal rules, had been notified on Aug. 30 about the baboon’s death, department spokesman Mark Bruce said. The results of a necropsy aren’t yet available. It is the third of Huntsman’s animals to die in state custody since the Department of Agriculture took five tigers, two pumas, two baboons and a chimpanzee from the farm in May, saying the farm hadn’t met Ohio’s tightened restrictions and permit requirements for keeping such creatures. One of the tigers gave birth to four cubs at the state holding facility in Reynoldsburg, and two of those cubs died. Huntsman said the baboon, named Pandora, had been taken in by Stump Hill after a Pennsylvania family couldn’t care for her. The animal had anxiety problems but was otherwise healthy when she was seized, Huntsman said. The baboon’s death further discourages Huntsman, who has legal challenges pending in an effort to get her animals back. Ohio enacted its stricter rules on ownership of dangerous wild animals after a suicidal man released lions, tigers and other creatures from a Zanesville-area farm five years ago. Many of the animals seized since then have been relocated to state-approved facilities elsewhere. Bloggers note: Take action immediately!!! Animals were placed in a facility operated by the ODA that does not met the requirements for a holding animal facility concerning Animal Welfare. The ODA does not have a USDA permit for operating a commercial animal enterprise business. The ODA should be charged with AETA for these violations. *Copy of your complaint should be sent to the FBI in both Ohio and Indiana as well as the Attorney General for both states. Already an adult lion and 2 tiger cubs have died at the ODA facility; others dying at the facility is unknown but should be of concern. Black Pine Animal Sanctuary has accepted animals illegally from the ODA and placed the animals into sub-standard conditions which the animals are not accustom. 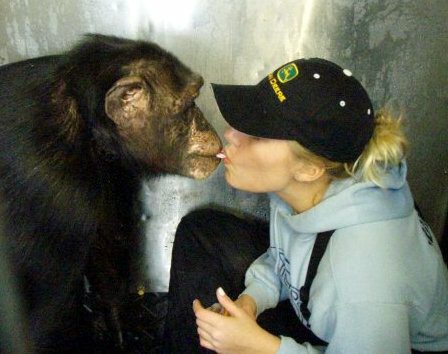 Black Pine is now caring for Huntsman’s chimpanzees without obtaining a USDI for proper transfer of endangered animals across state lines. Both Black Pine and the ODA are in violation for animals crossing over state lines as both as conducting official commercial business involving exotic and endangered animals. This is not the first time Black Pine has accepted animals and the longstanding rightful owners remain a their actual owners…Black Pines Animal Sanctuary is not qualified to have those animals and they are at that facility without owner consent…I hope these owners file suit against Black Pine for all animals alive or have died and of course the ODA!!! It is rather hypocritical that the ODA who has taken on the responsibility of seizing animals that are not properly permitted by the state of Ohio for various reasons including but not limited to state permit. Lacking equal protection of the law, the ODA has broken several federal laws and lacks a proper USDA permit to conduct business involving the proper care of exotic and endangered animals at their facility, providing contracts for owner transfer or for leasing animals to another out of state facility or for transport across state lines and by not obtaining a USDI for each endangered animal they placed is another out-of-state facility. While it might not seem terribly important, I assure you this is extremely serious and constitutes itself as a crime; especially when the state of Ohio is operating without the proper federal permits themselves. ~ by topcatsroar on September 13, 2016.